Dena Lanier is president and owner of The Lab 2000 Inc., CDL. She is the past president of the Southeastern Conference of Dental Labs SEC as well as past president of the Georgia Dental Lab Association. Dena was selected as one of the Top Twenty Five Women in Dentistry by Dental Product Report in 2011. 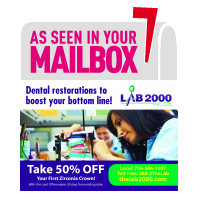 Dena serves as the president of the NADL (National Association of Dental Labs) . Dena writes a monthly column for JDT Unbound where she is Ms. Marketing. Dennis Lanier has been a dental technician for 39 years and is general manager for The Lab 2000, Inc. After graduating from Career Academy School of Dental Technology, he worked at J Minor Sturgis Dental Laboratory and then as a private technician before opening his own laboratory. Dennis has been with The Lab 2000, Inc., since 1995 and is very proud to be a Certified Dental Technician. In 2016, Dennis was awarded the ACP Dental Technician Leadership Award. "We provide a perfect product, always on time and you choose what you pay"